In a March contribution to the TILT blog, my colleague Christina Petersen took up the topic of “Screencasting as a Way to Enhance Learning,” discussing how screencasts – teacher-created instructional videos – might be integrated into a class and how they can impact learning. That post (and a larger conversation of the CEI Pedagogical Journal Club) got me thinking about reports I’ve heard from faculty that students seem to respond better to informal and conversational web videos rather than polished, high-quality offerings. This is certainly good news for those of us who want to use instructional video but have concerns about what we create from our desktops not being “perfect” enough. I decided to look into the issue and see if I could find some research on the subject, and my reading brought me to the work of Richard Mayer, a professor of psychology at UC Santa Barbara and one of the foremost authorities on learning from multimedia. Mayer has studied how students perform on tests of knowledge transfer after using multimedia of various design, and has developed a list of research-based principles that can guide instructors who are planning to develop and use multimedia in their courses. These principles can apply whether the multimedia in question is a voice over PowerPoint lecture, an animation, or a screencast. design to support generative processing (helping students make sense of material by connecting it to what they already know; this goal includes increasing student effort and motivation to learn). Let’s look at each of these goals, and a few of the corresponding principles that Mayer has identified, with the purpose of providing guidance for how you might conceptualize and build your next slide show. Extraneous processing occurs when students are given irrelevant information in the lesson, making learning the primary objectives more difficult. Students need to be clear about the learning goals for the segment and have their attention drawn to relevant material. In his “Signaling Principle,” Mayer recommends adding cues to the design of the learning object that focuses the learner’s attention on what’s important in the material. For verbal material, you might include an outline (or structure of content) for the material; you might use headings and subheadings, or you might highlight important textual information. For visual materials, consider including arrows that point at key elements of the graphic or highlighting areas to draw attention to important material. Mayer also recommends eliminating interesting, but ultimately irrelevant, information from educational multimedia, citing his “Coherence Principle.” (An example of irrelevant information would be a including a video of a caravan of bedouins crossing a desert in a lesson on the causes of desertification.) 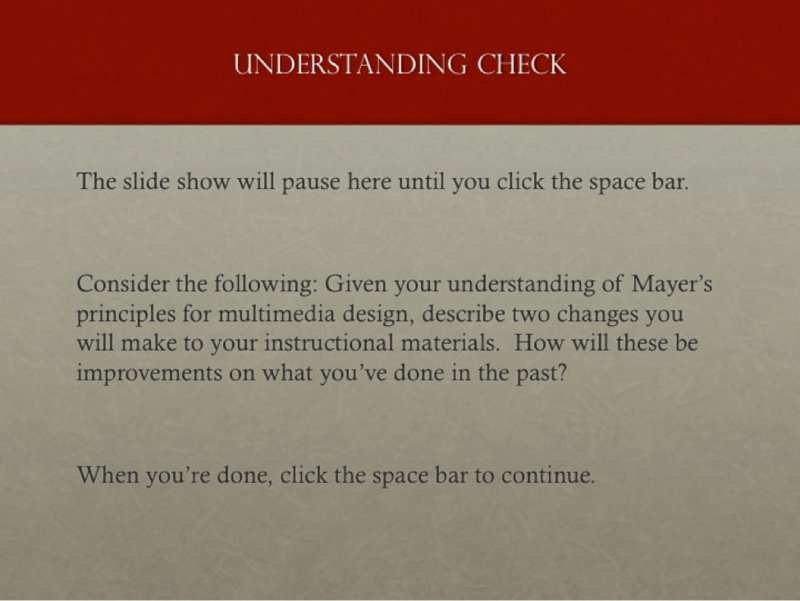 This information might seem fascinating to instructors and a good way to motivate students or pique their interest in a subject, but according to Mayer it distracts students from the primary instructional objectives, raising the mental effort required to process essential information. Students presented this type of ancillary information did worse on tests of transfer, and their performance was worse still when the ancillary information was particularly interesting and arresting. The “Redundancy Principle” suggests that narrating on screen text verbatim results in greater mental effort and poorer learning. To avoid this, consider elaborating on slide text in full sentences, or better yet reduce the amount of text where appropriate and/or use a picture or graphic to convey the information. 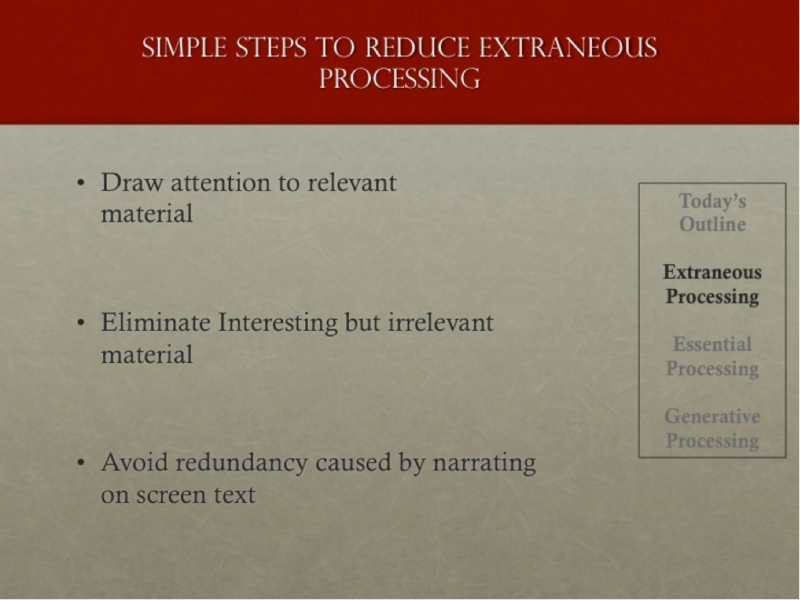 What are some simple steps you can use to reduce extraneous processing? For PowerPoint presentations delivered in front of a class, consider beginning with an outline of the content and signaling that outline as you go through the lecture. Use consistent headings at the top of slides or perhaps a legend on the side of the screen to alert your students to where you are in the material. This can be simply done by creating a template for your slide show that includes a text box with your outline; use grey text to suggest areas you have or will cover and black to signal what you’re focusing on at the moment. How will you communicate the structure of content? Through an index or headings? Perhaps you need to pay special attention to emphasizing transitions in your narration, using words such as “first we will, then we will….” Might you emphasize particular graphical information through arrows or screen highlights while emphasizing corresponding words as you’re speaking? Do you have adequate visual imagery in your slide deck or is your presentation simply narrated text? According to research conducted by Mayer, students perform better on transfer tests when instruction is presented in both words and graphics as compared to words alone, so make sure you’re consciously substituting images for words in your slide shows whenever possible. Essential processing occurs when learners select relevant material from lessons and attempt to organize it. To manage essential processing, Mayer suggests paying attention to the “Segmenting Principle,” which suggests that “people learn more deeply when a multimedia message is presented in learner-paced segments rather than as a continuous unit.” In this way, the learner has control over the pace of her learning, allowing her to fully process information before moving on. This principle suggests two practices that instructors should keep in mind when developing materials for their students to use outside of the classroom. First, keep the length of multimedia materials that students view short. Break up longer, complex lectures or other content into short segments. Videos of between 5 and 20 minutes seem to be a good option, rather than an entire 50-minute period presented as a single sequence. For narrated slide shows that you record using PowerPoint, consider either chunking content into a series of short presentations or setting slide transitions to pause at certain points in a longer presentation, resuming only when the learner presses a key or clicks a mouse. 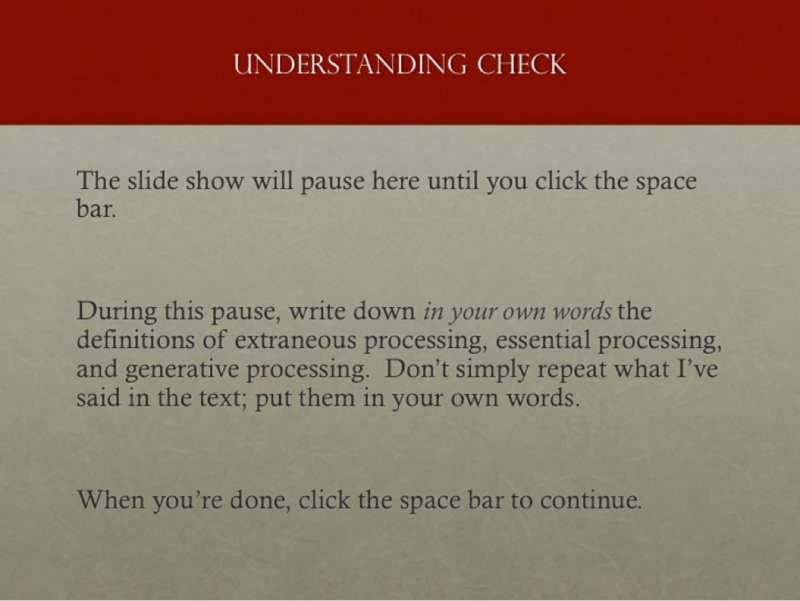 These pauses might be good places to include an “understanding check” slide that asks the learner to process the information being presented. This transitional point would also be an opportunity to re-present the outline of the presentation, calling the learner’s attention to what’s been covered and what’s coming up. Controlling how your students move through information is relatively easy with PowerPoint (for help, seek out tutorials about recording slide shows and setting slide transitions). It’s more difficult with video, although the same principles apply. For those who want to create instructional video rather than simple narrated slide shows, contact your educational technology support center to discuss tools to use and strategies for beginning development. Generative processing indicates the degree to which the learner is willing to put forth effort to learn the material. It involves learner motivation, as well as instructional cues that promote the sense of social immediacy in the learning environment. In short, promoting generative processing involves using social cues to motivate the user to learn. Mayer’s “Personalization Principle” asserts that multimedia presentations recorded in a conversational style suggest social presence to the learner and motivate him to try harder to make sense of the material. Using a conversational style, voice, and gestures enhance a sense of social presence and promote generative processing. Simply referring to students directly (“you will see now…”) and using the first person in narration (“I will describe…”) are simple strategies for increasing this sense of social presence. It is for this reason that informal instructional video—that which is shot from an office web cam and doesn’t seem overly scripted—can be a powerful learning tool. It puts students at ease to see a real person speaking in real terms. This is good news to faculty who are interested in creating video lessons and feedback but who are concerned about the time it might take to create scripts and reserve time in front of a green screen. Such efforts (while important for some types of high-profile multimedia—think MOOC videos) is actually counterproductive for daily or weekly instructional multimedia. Powerful, affordable, and easy-to-use tools for creating multimedia learning objects abound these days. Creating multimedia is no longer the primary challenge for most faculty; designing for learning is. Attention to the instructional design of your learning objects is essential to making sure the effort you put into creating your multimedia pays off. Refer to “7 things you should read about multimedia assessments” (2/19/14) https://uminntilt.wordpress.com/?s=multimedia&submit=Search.